Exciting stuff happening in Bozeman, MT right now. Salmonflies, salmonflies, and more Salmonflies. And caddis. Lots of caddis. This has meant great fly fishing for our anglers and Bozeman fly fishing guides. Salmonflies have been in full swing on the Madison River. Lots of big fish coming to the net. We have been fishing nothing but dry flies for the past week and look to continue doing so in the weeks to come. Thick hatches of stonefly nymphs, caddisflies, PMDs, and green and drown drakes has made for exciting surface action all day long. The Yellowstone River is quickly coming into shape, the Madison River is fishing as well as it ever has, the Missouri River flows are dropping back into great dryfly fishing levels, and most of our smaller streams are starting to fish. Life is good for anglers in Bozeman, Montana. Has been the main event the past week and will continue to fish great in the weeks to come. The annual salmonfly hatch is well underway and has meant phenomenal dryfly fishing for larger than average Madison River trout. The salmonfly hatch always ebbs and flows, but we have had consistently great days from Ennis all the way to Lyon’s Bridge. The big bug action has been starting early on warmer days and later on cooler, peaking around 2pm. Caddisflies have had fish looking up early and late. PMDs, drakes, and goldenstones are also around, making for great second fly action mid-day. The big bugs always mean big crowds, so don’t expect to have the river to yourself, but join the party and enjoy some of the finest fly fishing in southwest Montana. We have had a rollercoaster ride of flows the past few weeks on the Missouri River, but things are finally trending down, presently at just over 12k. The canyon is clear, the river is fishing well, and hatches of PMDs, caddisflies, and terrestrials have kept the fish looking up. Look for flows to go below 10k the coming week and even more fish looking up when they do. Crayfish have been getting it done subsurface. Go deep out in the middle or go short on the bank to get it done. Sowbugs, PMDs, Caddis Pupa, and big attractor nymphs are all great bets as your second fly. 6ft to split shot and you can fish anywhere. Mother MO has been good to us this year and things look to only get better as we move through summer. The Yellowstone River summer fly fishing season has finally begun. And here much sooner than we would have thought. Between record snowpack and heavy rain we were thinking this day would be here much later. But here we are. Reports have been good from the Yellowstone from boats staying above the Shields River confluence. Mud below. Salmonflies are out and flying around bringing some fish to the surface, but nymphing and streamer fishing have been the top producers. 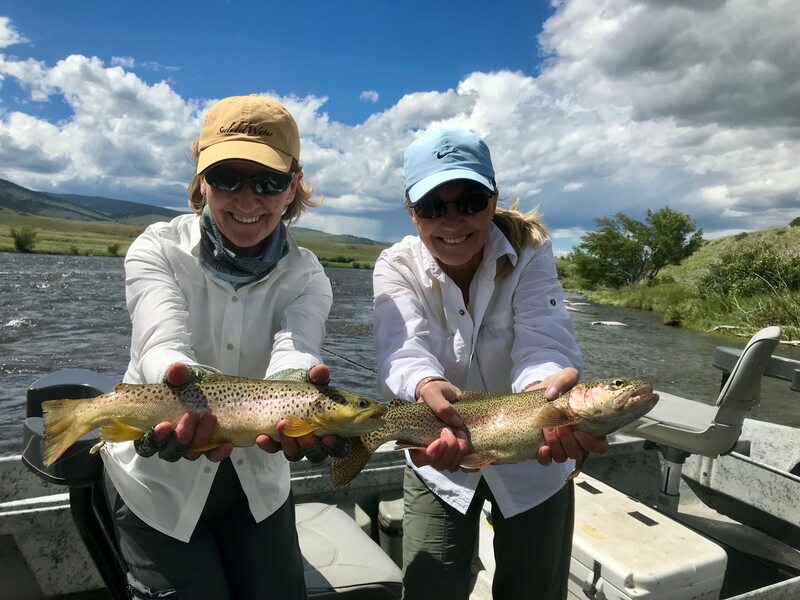 We still feel the fishing on the Madison River is and will continue to be the best bet for anglers in the Bozeman area for the next week, but look for this to change quickly as the Yellowstone River flows continue to drop and clarity improves. Flows are still at 10K which means floaters should continue to exercise caution and not get in over their heads, but the Yellowstone River is open for business. Stonefly nymphs, large caddis nymphs, buggers, and other large attractors will be your best bet subsurface. This is a great time of year to throw around giant streamers for trophy brown trout while clarity is still a bit off. Get after it! Early July is a great time to be on the Paradise Valley Spring Creeks. Bugs are hatching, fish are rising, and a good reach cast will be rewarded. PMDs continue to hatch as well as sporadic caddis. Well fished ants and beetles will also fool these selective trout. Nymphing with midges, mayfly nymphs, and sows/scuds continues to be great as always. The fish have seen a good number of poorly presented PMDs at this point so think about sizing down and making your first cast count. The trout can be ruthless here. Bring your A-game. A lot of options in Yellowstone Park right now for fly fishing anglers. The Gibbon River, Madison River, and Firehole River have plenty of clear and cool enough water to keep anglers entertained. Caddis continue to hatch daily. The Lamar River, Soda Butte Creek, Yellowstone River, and Slough Creek are still high for our liking but fish can be caught subsurface with stonefly and other large attractor nymphs. The Gardner River is probably the best place to be right now as flows are great, water is clear and cold, and plenty of bugs are hatching. Salmonflies and goldenstones are the biggest bugs on the water, but expect fish to eagerly come up for a variety of mayfly and smaller attractor patterns. Beetles, ants, small hoppers, and #14 parachutes are always a great bet. Chubby-Rubby and other dry-dropper combo rigs will work well in the pocket water. Things will only improve in the upcoming weeks and we expect the Yellowstone River in the park and its tributaries to be great options very soon.